A municipality in the south of the country is focused on providing maximal support to the customers. Therefore, they decided to start using the Anywhere365 Unified Contact Center (UCCUCC stands for Unified Contact Center and consists of a queue that can be handled by Agents Each Contact Center has its own settings, interactive voice response questions and Agent with specific skills. Agents can be member of, or sign up to, one or more Contact Centers.) in combination with Microsoft LyncMicrosoft Lync (formerly Microsoft Office Communicator) is an instant messaging program designed for business use and is the successor of Windows Messenger. In order to use Lync, a Microsoft Lync Server is required. and Skype for BusinessSkype for Business (formerly Microsoft Office Communicator and Microsoft Lync) is an instant-messaging client used by Anywhere365. In order to use SFB, a Microsoft Skype for Business Server is required. Skype for Business is enterprise software; compared to Skype, it has different features that target businesses.. Today this organization has over 10 departments and more than 150 employees. 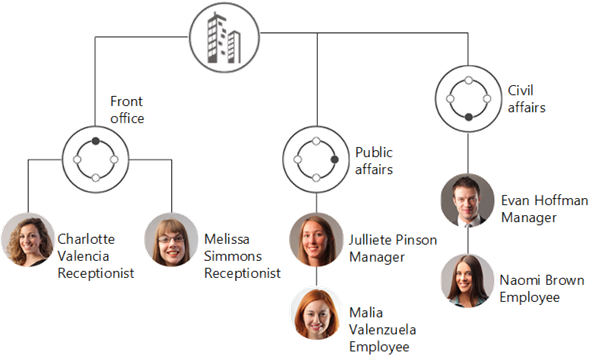 Every department has its own UCCUCC stands for Unified Contact Center and consists of a queue that can be handled by Agents Each Contact Center has its own settings, interactive voice response questions and Agent with specific skills. Agents can be member of, or sign up to, one or more Contact Centers. 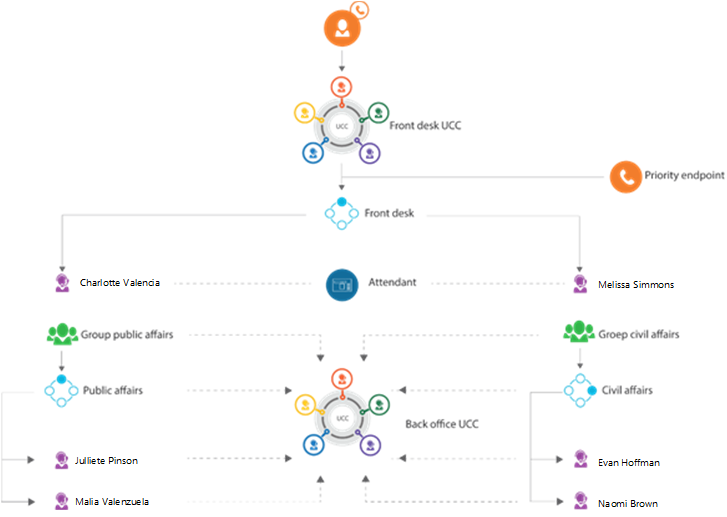 This scenario describes the steps taken by Inflight Enterprises to optimize their Anywhere365 UCC for the reception desk and the two of the departments, civil- and public affairs. When a person is unavailable, it remains possible to forward the call. When a transferred call is not answered, the call falls back to the next available agent instead of to the front desk. No single person will be overloaded with calls, the front desk used to transfer the call to the first name on the department list. 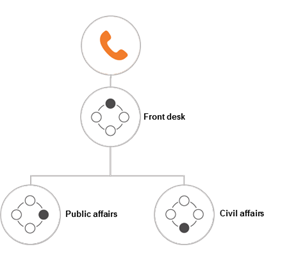 Not only external calls, but also calls from within the organization will be handled by the reception. In this scenario, managers have a special “hot line” number which they can use to make priority calls and skip the queue. Next the Skills “Civil Affairs”, and “Public Affairs” should be created on the BackOffice UCC. Add desired Questions / AudioQuestions. Fifth, endpoints should be created in order to forward calls to make priority calls to the Reception and forward calls from the reception to Civil- and Public Affairs. Once the endpoints are created in the UCC Settings, it should also be created in the Lync Topology. Learn More to create endpoint in Skype for Business. Add "SIP:PublicAffairs@INFLIGHT_ENTERPRISES.com" as Modality Endpoint with Parent Question "Question 0-1". Add "SIP:CivilAffairs@INFLIGHT_ENTERPRISES.com" as Modality Endpoint with Parent Question "Question 0-2". Tip Enterprise users can add the Skill directly on the Endpoint. Sixth, the UCC settings for the Frontoffice should be changed, in order for the Reception Attendant to work properly, using the following settings. Note This enables the features for the Reception Attendant.